A splashy Bollywood musical for '60s pop culture fanatics, Jewel Thief updates the old Prince and the Pauper identity switch to a Technicolor universe comprised of the filmmaker's fondest bits from James Bond, The Pink Panther, and European comic strips, peppered with the usual spirited musical numbers. The result is an irresistible confection, just the kind of thing to throw on at a party to keep the guests' eyes occupied. A series of high profile jewel thefts have put the city on edge, and sweet-natured Vinay (Dev Anand) has the misfortune of being mistaken for the lookalike culprit, Amar. Even worse, Amar's jilted fiancee, Shalini (Vyjayantimala), accuses Vinay of breaking her heart, and her brother (Ashok Kumar) is out for blood. To get to the bottom of the mystery, Vinay poses as the jewel thief to learn his opponent's next move and tangles with a bevy of beautiful, jewel-spangled women eager for love. Filled with charming highlights, Jewel Thief somehow manages to stretch its unlikely concept to a nearly three hour running time while rarely running out of steam. 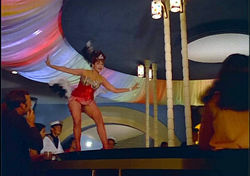 Apart from the obligatory slow love ballad, the musical numbers are all well integrated into the film and pulled off with great panache, particularly an inspired nightclub act which finds the stunning Helen (of Gumnaam fame), decked out in huge feathers and a skimpy showgirl outfit, prancing and belting out a number on a circular stage while another chanteuse mimes her actions for the gentlemen below. 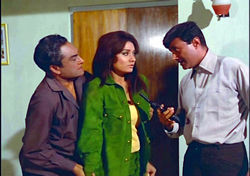 Though he occasionally lapses into unfortunate mugging, Anand is a sympathetic and effective hero; he also does the action routine very wel, and while the film could have perhaps done with a couple of additional thriller set pieces (not exactly a Bollywood speciality), the hair-raising climax is more than satisfying. 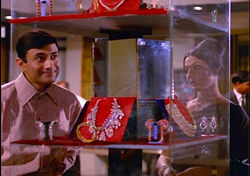 The film proved to be so influential and popular that countless imitations were churned out, with an official sequel starring Anand, Return of Jewel Thief, finally appearing in 1996. The Eros International DVD is a real sparkler, appropriately enough. Despite some noticeable element damage here and there in the form of emulsion scracthes, the transfer looks terrific with eye-popping colors in the best Technicolor tradition. Beware the previous, non-Eros DVDs which briefly appeared on the market; they look washed out and ragged, and don't feature English subtitles. The Eros disc features optional subtitles which whizz by a little quickly, so get ready to do some speed reading. The stereo mix (billed as 4.0 surround, which translates to 2.0 really) sounds fine for the film's vintage; separation effects are minimal but the music sounds robust and appropriately loud. The disc includes the usual song search function and a generic reel of coming attractions trailers.